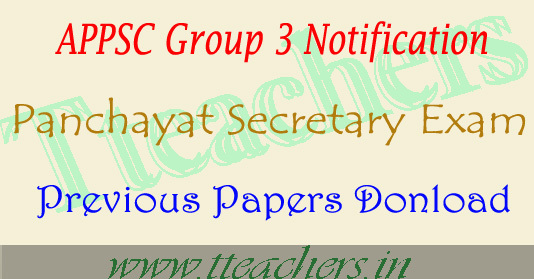 APPSC Group 3 previous papers 2017 ap panchayat secretary exam model papers download : APPSC planned to conduct the group III exam 2017,officially they has release Group 3 notification 27.12.2016. A huge number of candidates are planned to appear in the appsc Group3 recruitment exam 2017 which will be conducts Screening test in Offline mode in case applicants more than 25,000 on 23rd April 2017. So those candidates who are searching for the APPSC group 3 model papers and previous papers for practice purpose. Here we have given the AP Panchayat Secretary posts exam previous question papers and model paper for 2017 Group 3 exam. You can free download the APPSC Group 3 written exam model papers from the following link . The people who are going to appear in the appsc group III examination 2017, can get the paper 1 and paper 2 of the three language previous papers.Which languages are English, Telugu, Urdu.On our tteachers.in web site we have given the APPSC group III of the question paper 1 & question paper 2 with the answers. The Group 3 papers are General studies paper, Mental ability paper & Language Ability paper and also the Contemporary Problems. You can directly, access to download the APPSC Group 3 exam question papers for the last five years from here. Eenadu Pratibha ,Sakshi Education and manabadi.com will provide the APPSC Group 3 panchayat secretary exam recruitment old or past year Question Papers with Answer key solutions to practice for appsc Group 3 exam 2017 and Candidate guessing important questions from the Previous Question Bank. The Group 3 Sample Papers available from the Eenadu Pratibha ,Sakshi Education portal in paper wise for Group 3 General Study's and Group 3 Rural Development Question Bank. The people can get the APPSC Group 3 Panchayat Secretary Jobs previous question paper can get it from here. 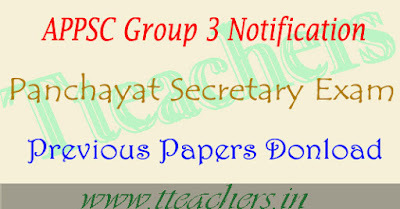 For more detailed information about Group 3 question papers, can comment on the below tteachers.in web page. The candidates, those who may not know to free download the APPSC Group 3 old papers, can get it by using the instruction in the below. open appsc website https://www.psc.ap.gov.in/, the official site will be opened. From that, find the previous question papers notification. Then click and get the Group 3 paper 1 & 2 sample papers.